Of the following young stars in the league: Rajon Rondo, Derrick Rose, Kevin Durant, John Wall, and Tyreke Evans, which do you think is the most exciting to watch and which player is most valuable to his team? Derrick Rose is a driver and slasher who is gifted with incredible athleticism. 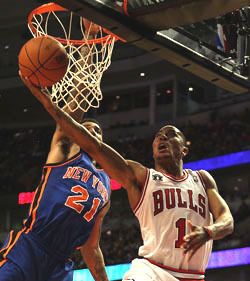 Rose energizes his teammates and his aerial displays always electrify the crowd. Whether he’s blowing past his opponents to score points in transition or taking on the big guys in a half-court set, you tend to remember all of Rose’s great moves. Kevin Durant is more of a jump shooter than a driver, but what makes him such an exciting player is how many points he racks up with apparent ease. Durant scores and isn’t sweating. So you might pick up a stat sheet at the end of the night and be surprised by his points total because he gets them in such a smooth manner you don’t even realize what he’s doing. 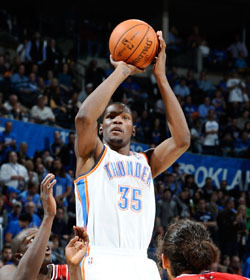 Durant makes 40 ppg look easy. All the players you mentioned are key ingredients to the success of their respective teams. Though Rajon Rondo is surrounded by three Hall of Famers, he is the driving force behind them. Rondo, Rose, Durant, Wall and Evans can all be considered MVPs relatively speaking. Thanks for your question Darwyn. Keep an eye out for the answer in this weekend’s Ask the Czar post. Hey can u please tell Anthony morrow, Andre Miller, and Wes Matthews to get 11 rebs so i can win my fantasy league game?